In the past, despite the fact that it’s been a long time since I’ve seen a classroom, back to school has been my favorite time of year. Armed with new office supplies, it’s my hot weather version of New Year’s. A time that to me represents a fresh start and the return of a more regular routine. This year, things have gotten off to a bit of a rocky start. Last week, I had a “dog ate my homework” moment. Returning from being out-of-town, I just needed to add the recipe for a post on “Ginger and Jalapeno-marinated Grilled Chicken” before I could publish it. I’m still dumping out folders and flipping through stacks of paper in hopes of finding my recipe notes. They remain elusive. Yesterday, the President messed up my plans. 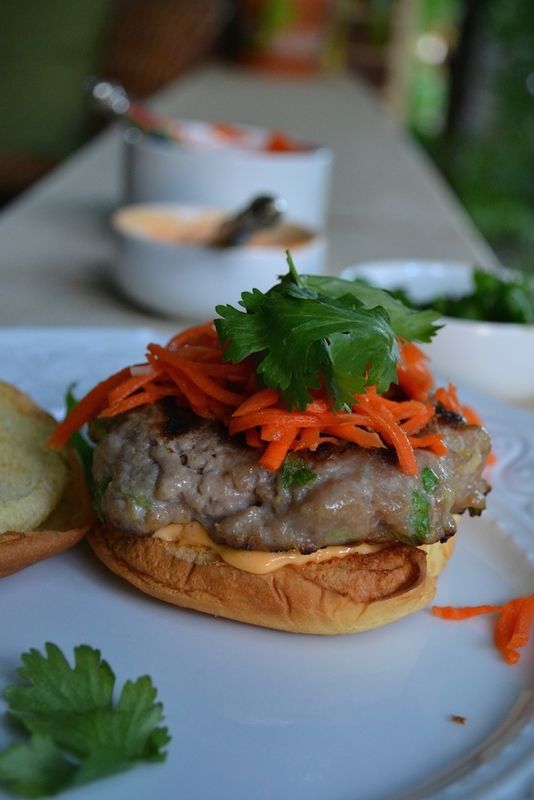 I was scheduled to share a recipe for banh mi burgers on Charlotte Today yesterday morning, but a visit to Charlotte by President Obama meant the focus was not on French-Vietnamese delicacies with an American twist, but rather veterans affairs. I’d argue this is a good thing, but once again my blog plans have been waylaid. The segment, which we still taped, will air at a later date and I promise to share it then. 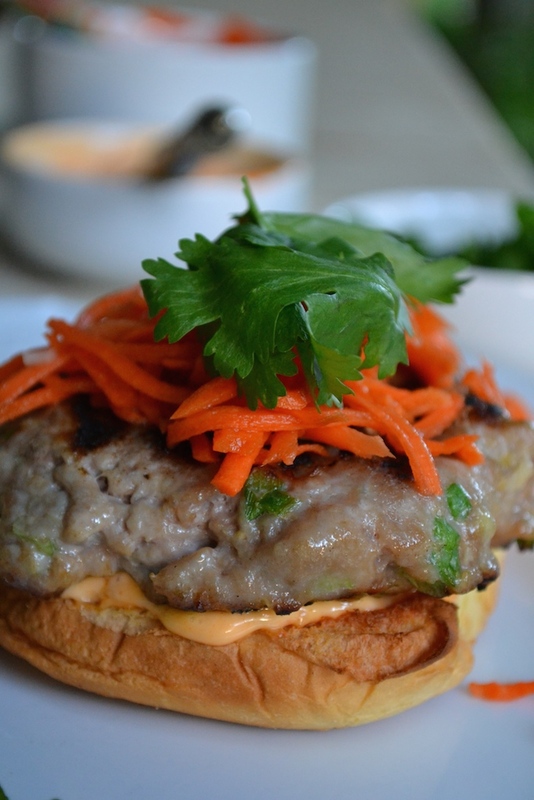 In the meantime, here’s the recipe for banh mi burgers. After all, perhaps your return to school has been a little bumpy too and you need a simple, but delicious meal to set things right. I think these juicy burgers, bursting with great Asian flavor, are just what you need to get you back to the head of the class. And if that doesn’t work, a trip to your local office supply store to load up on some new pencils and post-it notes, can’t hurt. Happy cooking! In a small bowl, toss the grated carrots with the granulated sugar and unseasoned rice vinegar. Let stand for at least 30 minutes and preferably one hour at room temperature. Stir often. In another small bowl, whisk together the mayonnaise and sriracha hot sauce. Cover and chill until ready to use. In a large bowl, combine the pork, garlic, green onions, jalapeño, lemongrass, fish sauce, sugar, salt, cornstarch, and sesame oil. Mix it all together with your hands. Shape the mixture into 4 patties and set aside. Heat a grill or grill pan over medium-high heat. Brush the grill with oil to keep the burgers from sticking. Grill the burgers for about 5 minutes on each side or until cooked through and the internal temperature reaches 165 degrees. 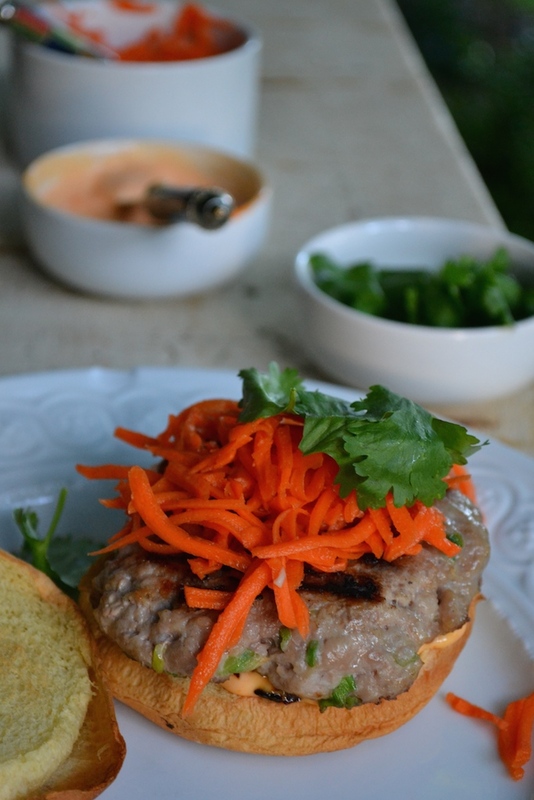 Serve the burgers immediately topped with carrot slaw, fresh cilantro leaves, and sriracha mayo.